Join us for the 26th Nicolet National Forest Bird Survey! 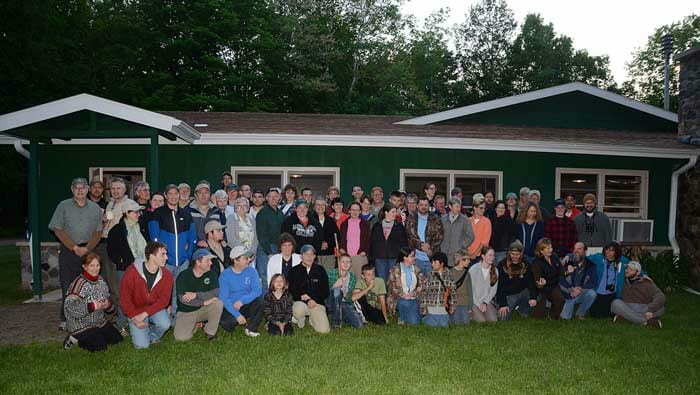 This year the NNF Bird Survey will be held on June 8-10, 2012 with headquarters at Trees for Tomorrow in Eagle River, WI. The Nicolet National Forest Bird Survey is the longest running citizen-science based bird monitoring program in a U.S. national forest. The Bird Survey takes place each year during the second weekend in June. Everyone with an interest in birds and a desire for adventure is invited to participate in the Bird Survey. Dorm style housing for Friday and Saturday are provided free-of-charge for participants and their families. All meals are provided on Saturday. An early continental breakfast is provided on Sunday. On Friday eveningvolunteers are assigned to small groups that are led by at least one expert in bird song identification. Other members of the team participate as timekeeper, navigator, or data recorder. So don’t be discouraged from volunteering if you are a novice birder. Each group selects 6 to 12 sites to survey over the weekend. Each year between 60 and 100 volunteers survey about 150 sites. Over 60 volunteers joined biodiversity center students and staff and US Forest Service personnel at the 2011 Nicolet National Forest Bird Survey. The Bird Survey begins early Saturday morning when participants gather for coffee and a light breakfast of muffins and fruit at 3:30 am and head out to get to their first site by dawn. Sites can be located along roads, while others require a short hike into the target habitat. Road access points are marked in advance, and directions and gps units are provided along with topographic maps. Once at the site the group counts all birds heard and seen every minute for 10 minutes. They then make a 10 minute audio recording of bird songs at the site. Then it is back in the vehicle and on to the next survey point. Most groups complete their assigned sites by approximately 9:00 am. After they return to camp, groups complete the data forms (to facilitate computerized data entry) and check the forms for accuracy. Lunch is provided and the rest of the day is free for exploring the forest, visiting with friends, and of course taking a nap! Depending on the participants’ interests there might be other afternoon activities like a visit to a nearby wetland to view orchids or dragonflies. On Saturday evening there is a dinner and often a presentation and always contests and prizes for the most interesting and unusual observations. Volunteers Mike Grimm, Shirley Griffin, and Bob Ryan record bird songs at an upland hardwood survey point in the Nicolet National Forest. The quickest way to register is to send an email message to biodiversity@uwgb.edu. Include the names and ages and sexes of the members in your party and indicate if you will need housing at Trees for Tomorrow and who would like to room together. (Each cabin houses 4 people). You will need to bring your own bedding or sleeping bag and an alarm clock. Also let us know if you will be joining us for lunch and/or dinner on Saturday, so that we can get as accurate a count as possible. Or visit the NNF Bird Survey Website to download an registration form that you can mail in. Even if you decide to come at the last minute to join us you are welcome. Send us an email or just show up and we will find a place for you! What to bring besides your personal items. Check the website for maps to the camp, schedule, and more information. The Nicolet National Forest encompasses 360,000 hectares of mixed hardwood-conifer forests, lowland swamps, glacial lakes, and wetlands in northeastern Wisconsin. It comprises the eastern portion of the Chequamegon-Nicolet National Forest, with headquarters in Rhinelander and Park Falls, Wisconsin. 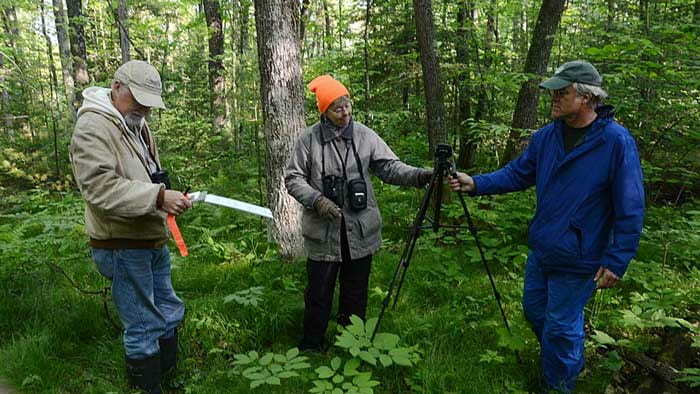 The Nicolet National Forest Bird Survey began in 1987 in response to the lack of quantitative information about the breeding birds in northern Wisconsin. 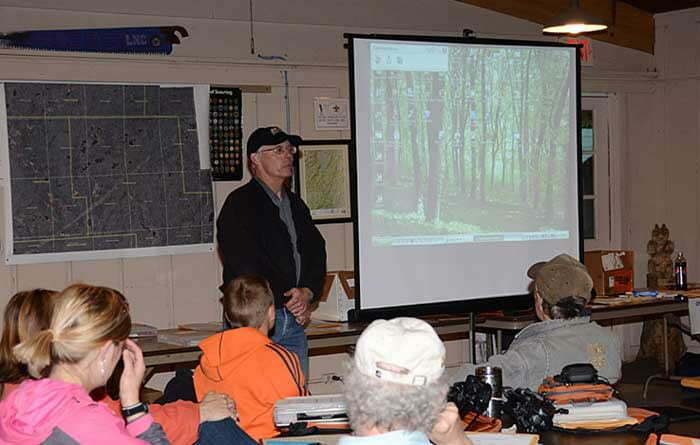 Wildlife Biologist Gary Zimmer, who helped to organize the first Nicolet National Forest Bird Survey in 1986, speaks to the volunteers at the 2011 Survey. Following publication of the 1986 Land and Resource Management Plan for the Nicolet National Forest, members of the Conservation Committee of the Northeastern Wisconsin Audubon Society wanted to provide a better foundation for assessing the impacts of forest management on bird populations. A proposal was submitted to Forest Service Biologist Tony Rinaldi, who worked with the Audubon Society members to organize the first Nicolet National Forest Bird Survey at the Boulder Lake Campground. The survey now alternates, surveying points in the northern or southern sections of the forest each year. Over 400 volunteers, including many of Wisconsin’s premier birders, including Sam Robbins, Noel Cutright, Bettie Harriman, Tom Schultz, Jim, Jeff, and Scott Baughman, Andy Paulios, Laura Erickson, John Feith, and others, have joined biologists from the US Forest Service and the University of Wisconsin Green Bay over the years to conduct the annual survey. Biologists and volunteers have now compiled more than 40,000 records of birds at 522 points, most of which have been sampled every other year since 1987 or 1988. This data has been used by many researchers and has contributed to several theses and scientific publications. Most importantly, the effort of our outstanding and dedicated citizen scientists has resulted in improved management of our northern forests and a better understanding of the ecology of forest birds.